"Looting this item will bind it too you." You're a person on the go. You can't wait around for loot rolls. You kill the boss and drop the group. So why waste time clicking twice when you could just click once? That's right, if you hit pass, you're done! Since you dropped group the instant you hit greed, you weren't getting the loot anyway. There is, of course, one downside. If you take the tenth of a second to hit greed before you drop group, you lose out on the 20% chance to screw someone out of a bit of gold for no actual gain to yourself. And that is definitely worth the time for someone like you. 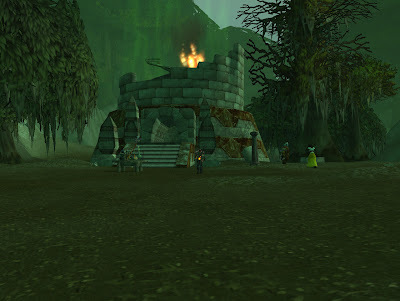 I log onto my shaman to test far sight. First thing I did was to go find the elevator to go learn flying. 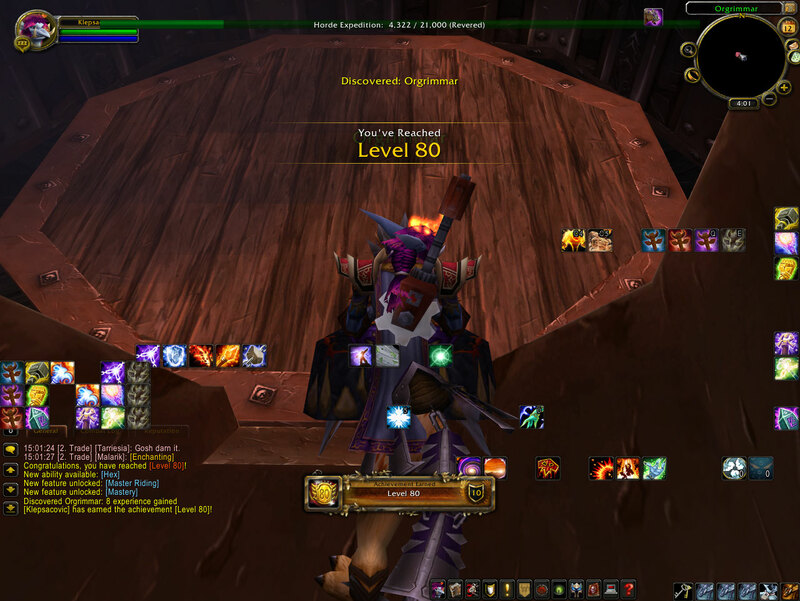 That caused me to discover Orgrimmar (something I've already done that the game says I haven't), and gain 8 xp, which made me hit level 80 (and I didn't even have to use a scroll of resurrection). 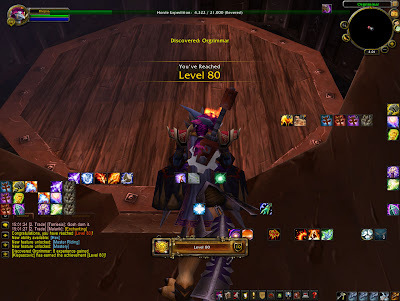 Cata leveling is way too fast. In related news, my gear was an indecipherable mess. Why is an elf sitting at the entrance? Why is another one (out of the shot) wandering around in a suit? Why is the tower burning? Why are the dwarf and gnome dancing? Whose cats are those? Did the tower explode? There seem to be some scattered blocks. Were the Forsaken involved? I see a slight green haze rising from the tower.